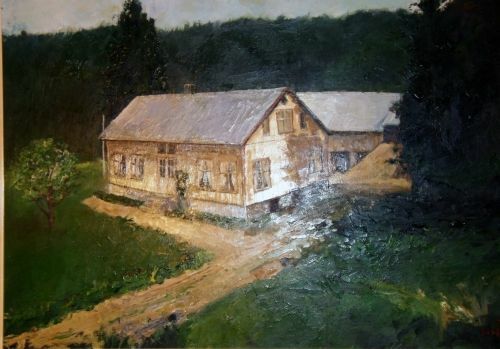 Photo of a painting of the farm Austjordet. based on a photo of the farm. Austjordet is the name of the farm where my father grew up. The farm is located in Selandsdalen in Grindheim in Audnedal. The farm was, as far as I know, earlier part of the Seland farm, but became a separate farm in the early years of the 20th century. It was originally owned by my grandfather (Tobias) and my grandmother (Tomine). My grandmother grew up on the Seland farm, and my grandfather grew up in one of the farms in the valley named Aagedal (= my family name!) which is not too far from Austjordet. When my grandmother died (in the early fifties), my uncle Soeren became the owner of Austjordet. He was not married, so when he passed away in the mid eighties, the farm was sold to the owner of the farm nearest to Austjordet (Ole Solberg). Ole died some time during the nineties, and then the farm was sold to a 'stranger'.. The old house and the barn have been removed several years ago, and a new house (big and beautiful) has been built to the left of the buildings on the picture (outside what is shown there..). When I did a research for a name for my web pages, the name aagedal.com was already occupied. So: my second choice was austjordet..